~ by admin on Jan 10, 2013. 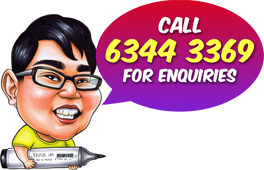 A gift for his brother wedding, he decided to give him a wedding caricature from us. He wants it to be simple with nothing fancy or elaborate. So we gave him this piece whereby the bridegroom carries the bride and both of them are smiling almost in a goof grin like manner. Both of them are attired in their wedding clothing with the bride carrying a bouquet of red roses. As for the backdrop we give them the ocean with vanishing cityscape to show the distance between them and the city.